We're more than just team sports. From our miles of hiking, biking and walking trails to our blueways and green spaces, there's something for everyone. Bike Town Spartanburg is dedicated to keeping our community informed on all of the bicycle related happenings around town. 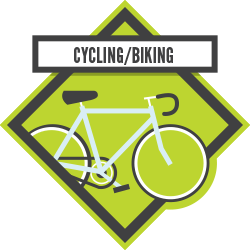 Our goal is to provide you with resources and information that will introduce you to all our Bike Town has to offer. Whether you are looking for a place to shop, a group to ride with or an event to attend, we've got you covered. In fact, we’ve been known as a Bicycle Friendly Community since 2006 and were the first in the state of SC to earn the recognition by the League of American Bicyclists. Spartanburg is also home of the Assault on Mt. Mitchell, one of the country’s toughest cycling challenges. Here you’ll find great road rides, challenging adventures in the woods, downtown bike rentals along with professional races hosted in our area. It’s one of the things that makes us revolutionary (that’s a nod to our history). Learn more about BikeTownSpartanburg. Learn about the wealth of activities available at Croft State Park in Spartanburg, SC. 15TH annual Tame the Tyger River race and float.